US, 1991, 95 minutes, Colour. Walter Matthau, Susan Blakely, Henry Morgan. Against Her Will: An Incident in Baltimore is a telemovie sequel to the drama The Incident. It starred Walter Matthau as a small-town lawyer in the immediate aftermath of the war defending an imprisoned German soldier against a charge of murder. It also starred Susan Blakely as his widowed daughter-in-law and Harry Morgan as a judge. 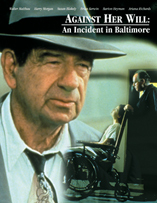 The main characters are reassembled for this film, with the judge extending a welcome to Walter Matthau's character to move to Baltimore and to start in a practice. The film shows the eccentric lawyer and the difficulty he has in settling, his relationship with his daughter-in-law and granddaughter, his resentment of the possibility of his daughter-in-law marrying again. He is approached by a man to help him get his fiancee out of a mental institution. This leads to an expose of the conditions in mental institutions in the United States in the '40s. The legal background of the film concerns immunity of the states from prosecution by the public - but an examination of a precedent at the time of Thomas a’ Becket and Henry II means a different interpretation of the law in Maryland. Walter Matthau is convincing as the hang-dog elderly lawyer. Harry Morgan has a good role as the crusty Judge Bell. The direction is by veteran Delbert Mann (Oscar winner for Marty and director of such fine films of the '50s as Separate Tables - and later a director of many humane telemovies). 1. Interesting and entertaining telemovie? The focus on characters? Incidents? The period? Issues of the mentally impaired? The law? 2. The re-creation of period, Baltimore in the mid-'40s? The atmosphere of the times? The city and houses, the courts, the mental institutions? The musical score? 3. The prologue and the focus on the brutality towards the victim in the pre-credits sequences? The significance of the title? 4. Walter Matthau as Herman Cobb? His age and experience, maverick, knowledge of the law? Moving with his daughter-in-law and granddaughter? His being beholden to the judge? The judge's motivation? The house and its amenities (and lack of amenities)? Going to court with the judge and the work being too easy? Not getting enough jobs? Moping around the house, going to the bar, trying to tell jokes? The chance encounter with the man and his concern about his fiancee? Herman going to the judge, the wariness, his telling the judge off, the threat of being fired? The judge and his help? His examination of the law, finding the Thomas a’ Becket precedent? The discussions, the District Attorney, going to the court? Winning the point of law? The build-up to the case? His visiting the institution, discussions with the doctor, encountering Donald, finding the victim, photographing her? Trying to get Donald to testify but his fear of the judge? The appearances in court, the cross-examination of the doctor, exposing the psychiatrist and his lies and taking money? The testimony of Donald? Going to rescue the victim? Donald and his testifying? The winning of the case? The personal crusade? The collaboration with the judge? 5. The background story of Billie, her getting a job, the encounter with Jack, his resentment about Billie dating, his memories of Harry? His unwillingness to talk? Billie and her leaving the house? The encounter with Jack? His coming to his senses? Getting Jack to bring them all to dinner? His love for Nancy and her influence in his change of heart? 6. Judge Bell, his feeling he had ruined Herman's life and therefore giving him a new chance? The house? The practice? In court and the easy fees? Not giving Herman jobs? The challenge and wanting Herman to leave? His change of heart, collaborating in the case? The precedent, finding the judge, going to court? His support of Herman? 7. Billie, the widow, memories of her husband? Devotion to Herman? The good relationship with Nancy? The decision to get a job, her musical background, in the shop? The chance encounter with Jack and his awkwardness? The decision to go out? Attracted to him, the possibility of marrying? Discussions with Nancy? The hostility of Herman and her not being able to cope? Moving out? The invitation to come back with Jack? Future prospects? 8. Jack, teaching maths, awkwardness, attraction to Billie? Asking her out, the clash with Herman? His being invited by Herman to come round, bring Billie and Nancy, go fishing? 9. Nancy, her love for her grandfather? Love for her mother? Missing her grandfather, talking to him? The happy ending? 10. The portrait of the mental institution? The surface gentility, the brochure? The reality? The exploitation of the victims? The brutal treatment, the false entries about shock treatment and therapy? The doctor and his cover-up? The psychiatrist and his diary and the false entries? Admitting the truth under cross-examination? The guard and his brutality towards Donald? 11. Donald, 50 years in the institution? Looking after the victim? Going to the judge's chambers but being afraid? Fearing a lobotomy, ringing Herman, the rescue? His testifying in court? The pathos of his life and its squalor? The aftermath and his staying on, the change of conditions? 12. The victim, the background in Greece, coming to America, depression? The sexual abuse? Her being left in the basement, wanting Herman to help her? Symbolic victim? Her fiance and his efforts to get her out? The Greek cafe owner and his support? Their presence in the court, the response? The final celebration? 13. The judge, his interest in history and precedents? His sympathetic handling of the case? The District Attorney and his assertiveness? The final deal? 14. The entertainment value of this kind of court drama? The critique of American society and the perspectives on the past? The treatment of the mentally disabled?